Otto Freundlich is considered a forerunner of abstraction. “He was the very first German abstract sculptor already making, before 1912, the year in which I met him, non-figurative works with excessive proportions or on the contrary minutely calligraphed sheets” (Hans Richter). Committed, both politically and artistically, he expressed a certain “awareness of the world” through his life and works, which were to “become the place where is set forth everything which contributes to the essence of the world: that of the Word” (Guy Tosatto). He studied history of art, philosophy and literature in Berlin, then in Florence and Italy and, in 1907, executed his first works, in the Jugendstil style. In 1908 he paid a first visit to Paris and rented a studio at the Bateau-Lavoir. He became part of the bohemian life of Montmartre that included Picasso, Apollinaire, Braque, Juan Gris, Max Jacob and André Salmon. For 10 years he lived between Paris, Munich and Berlin. In 1911 Otto Freundlich made his first abstract works, gradually developing a very singular pictorial vocabulary comprised of flat coloured areas defined by straight lines and curves covering the entire surface of the painting. Fascinated by different techniques – mosaic, tapestry, stained glass – he drew inspiration from the last of these and conducted research. From March to July 1914 he worked in the stained-glass restoration workshop of Chartres Cathedral and wrote to his friend Karl Schmidt-Rottluff: “For five months I was prisoner of the world at Chartres and I have emerged marked for ever”. He was equally impressed by the architectural dimension of Cézanne’s work and by Van Gogh’s strong colours. He studied the tensions and balances of power generated by geometric elements and chromatic variations and gradually managed to compose, as his worked developed, a powerful syntax that connects and gives energy to the groups of coloured units. Very active on the art scene, he took part in many exhibitions: Die neues Secession in Berlin in 1910 and 1911, and Erster Deutscher Herbstsalon (first German Salon d’Automne) at the Der Sturm Gallery in Berlin. He wrote for various reviews, notably Die Aktion which, in 1918, devoted a special issue to his work. After the German revolution of 1918 he enrolled as a member of the ‘Novembergruppe’ and, in 1919, organised with Max Ernst and J.T. Baargeld the first Dada exhibition at Cologne. 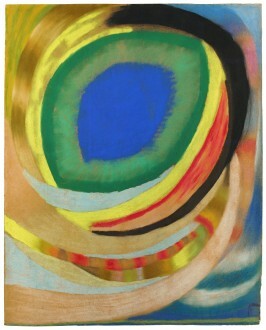 In 1930 he was a member of the group ‘Cercle et Carré’ and then, in 1931, of the group ‘Abstraction-Création’. As a theoretician of art, Otto Freundlich wrote in 1934 Die Wege der Abstrakten (The Paths of Abstract Art). In 1936 in Paris he founded a private academy called Le Mur, where he taught painting, drawing and printmaking. In 1937 Freundlich’s sculpture of 1912 L’homme nouveau figured on the cover of the catalogue of the travelling exhibition organised by the Nazis, Entartete Kunst (Degenerate Art), which denounced modern art. The exhibition included many Jewish artists. Fourteen of his works, in the collections of various German museums, were confiscated and destroyed. When the war broke out, Otto Freundlich, who was of German nationality, was interned by the French authorities. Freed in 1940, mainly due to the intervention of Pablo Picasso, he took refuge at Saint-Paul de Fenouillet in the Pyrénées Orientales. Denounced and arrested on 23 February 1943, he was deported to Lublin in Poland to a concentration camp. He was killed on the day of his arrival, at the age of 65. ”The artist receives the transformations of the world, he senses them in his acts and thoughts, like driving forces, long before they manifest themselves in the outside world. He has the faculty to gradually detach himself, lastingly, from the forms and truths that are generally admitted. He executes the wish of a new reality” (Otto Freundlich). Joachim Heusinger von Waldegg, Catalogue raisonné des travaux de l’Artiste, Rheinisches Landesmuseum, Bonn, Rheinland-Verlag, Cologne, 1978.